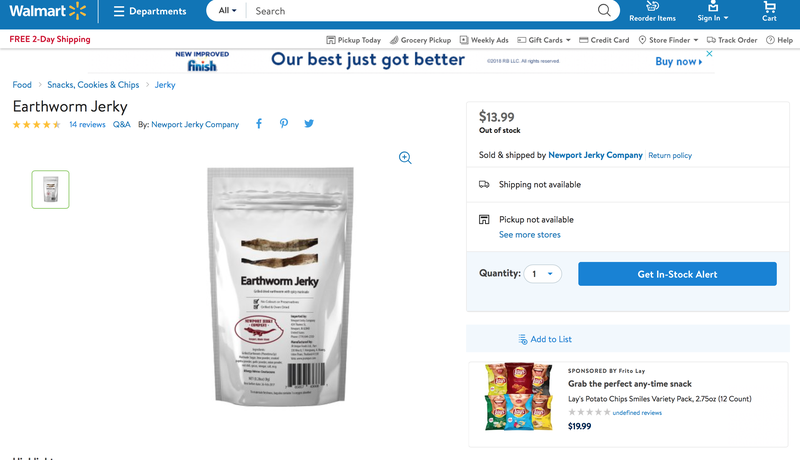 Our friends over at the Takeout discovered last week that Walmart’s website sold Earthworm jerky. As Gizmodo’s resident bug eater, I ordered some the moment I heard. This jerky tasted horrible, to my surprise. But please, don’t let that stop you from trying to eat strange invertebrates yourself. As scientists and futurists ponder food’s future, some have suggested that perhaps creepy-crawlies will play a role as an important source of protein for humans. Some suggest that maybe modern industrial agriculture uses too much water and energy, a problem perhaps bugs could solve one day. The key is getting people to eat them. Some cultures have long eaten bugs. It’s unclear how the United States would accept bug-eating as a whole, but some entrepreneurs think there’s an opportunity to introduce it. Earthworms are annelids, a kind of invertebrate, but I’ve just lumped them together as bugs given their creepy-crawliness. Before I get to the worms, let me start by saying that when prepared properly, bugs generally taste really good. Chapulín, a grasshopper common to Oaxacan cuisine, tastes like dried goji berry and pairs really well with chili and lime or even chocolate cake. Black ants have the texture of caviar and a sour citrus flavor. Bundaegi, silkworm pupae, taste like a mushroom, snap like a sausage and go perfect in stir-fry. Mopane worms have an intensely musky but pretty awesome taste. These earthworms instead join crickets in the club of bugs that taste like a dusty basement. A Thai edible insect company called JR Unique Foods actually supplies the worms. A woman picked up the phone when I called and said they didn’t have a lot left. Anyway, I ate them. The worms come in a resealable bag like an expensive camping snack. Inside there’s another smaller plastic bag, which contains maybe ten pieces of worm. They look about the same as the worms that end up dead and dried on the sidewalk after a rainstorm. The package says they’re of the Phretima genus, one found only in Southeast Asia. Apparently, they’re seasoned with sugar, lime, paprika, garlic powder, onion powder, and chili. It’s sticky and chewy like candy, a little sweet, and overwhelmingly dust-flavored. That’s sort of how lots of the most common bugs taste. That is not the way I was expecting as a fan of How to Eat Fried Worms. There are lots of people doing some pretty incredible things with bugs. Seek Food makes a cricket protein granola that I like better than regular granola. Chef Joseph Yoon runs Brooklyn Bugs and I’ve now been to several of his many-course insect tasting menu dinner parties. Everything always tastes very good. If you’re serious about giving bugs a taste, I implore you to try literally anything else, even scorpion, and you will be pleasantly surprised. I can tell you as a veteran bug eater that earthworm jerky does not taste good. It probably makes a good gag gift.